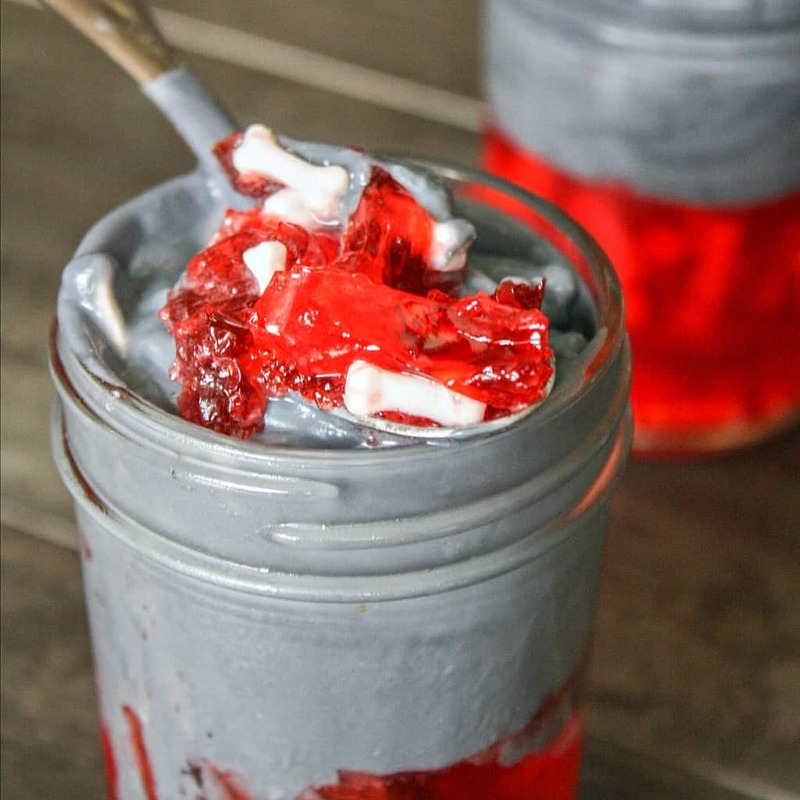 If zombies needed an afternoon snack, Dem Bones Zombie Snacks in a Jar would totally be it. I kid you not. Zombies will LOVE this–so, if there’s ever a zombie apocalypse, I want you to make this, have it prepared in the fridge, and then throw it at those zombies as they start to attack you. They’ll totally stop in their tracks, pick-up a spoon and stop chasing you (and stop making that horrid moaning sound). Heh. 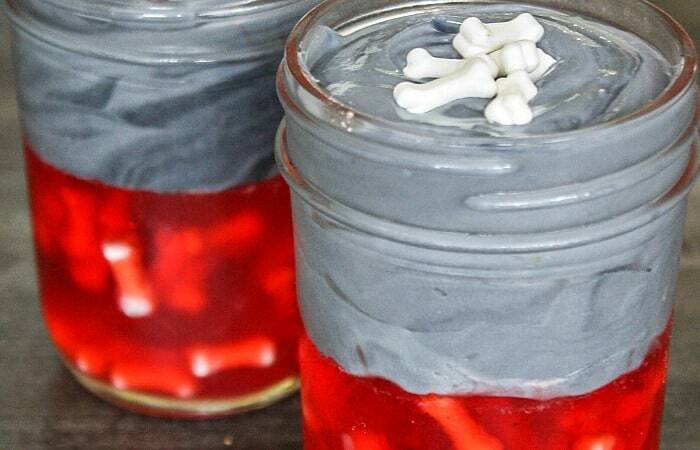 Don’t get me wrong, your kids will love these “Dem Bones Zombie Snacks in a Jar”, too. But, seriously, let’s just keep some on hand for the actual zombies, mmmkay? Even my teen thought this was pretty cool. His description of the snacks was not rated G though, so we’re just going to leave that between us. LOL! I liked munching down on the crunchy bones with the creamy pseudo ice cream…best snack I’d had this week, honestly. So, pin it. 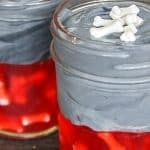 Keep Dem Bones Zombie Snacks in a Jar around in case of apocalypse and feed them to your kids after school sparingly. You don’t want to be out when the first zombies come a’knockin’. LOL! 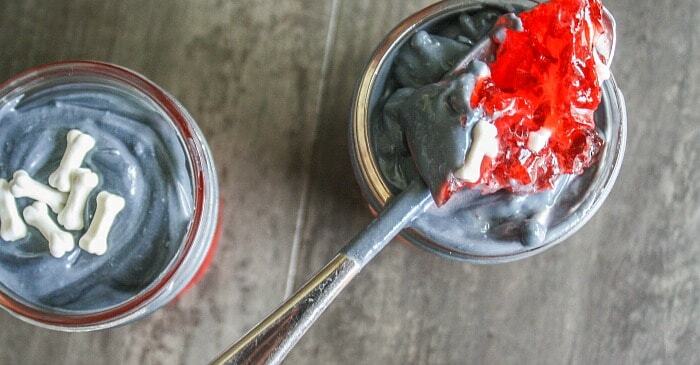 If zombies needed an afternoon snack, Dem Bones Zombie Snacks in a Jar would totally be it. I kid you not. Zombies will LOVE this. Pour into 4 mason jars (about halfway full). Cool the jello in the fridge for an hour and then place bones inside. Press down gently with a fork in need be. Return to refrigerator for remainder of chilling time to make sure jello is firm when served. Open can of coconut milk from the bottom and drain off water. Scoop cream into a bowl and add powdered sugar, vanilla and 10 drops black food coloring. Whip on high until mixture is fluffy and light. Remove from freezer and place in piping bag, then pipe onto the top of the jello. Top with more of dem bones. Return to refrigerator until you're ready to serve!